Fans of the hit manga and anime series “Attack on Titan” can now look forward to a BE@RBRICK of the iconic Colossal Titan, courtesy of Medicom Toys. 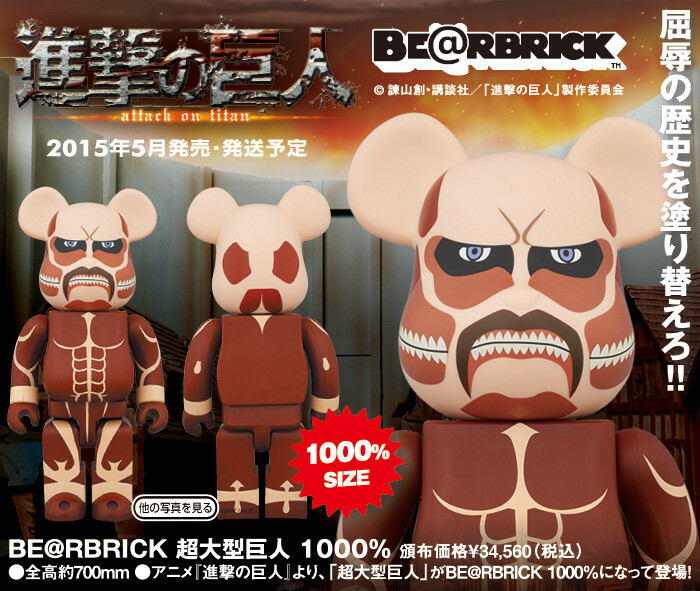 The 400% BE@RBRICK of the Colossal Titan, which stands at 11″ tall and released in February 2014, will receive a brand-new makeover into the giant 1000% BE@RBRICK line. The new figure will tower over the 400% version, reaching a height of over 27″! The 1000% BE@RBRICK is available for pre-order through Medicom until January 10th for 34,560 yen, and is scheduled to release in May. This enormous figure is one that diehard Attack on Titan fans shouldn’t pass up, so keep an eye on the upcoming release of this new collector’s item!